Though it won't matter much to the Saints and their fans, the NFL will acknowledge the obvious. Per a league source, the NFL intends to admit that the non-call at the end of regulation in the Rams-Saints NFC title game was indeed an error. Presumably, the league won't say anything about it during the AFC title game, in order to avoid overshadowing in any way the Chiefs-Patriots contest. But a public concession that a foul should have been called when Rams defensive back Nickell Robey-Coleman hit Saints receiver Tommylee Lewis early is indeed coming. The lingering question remains what the league will do to avoid similar situations in the future. 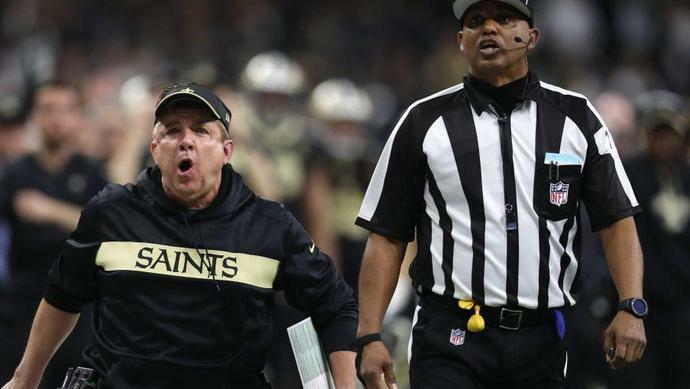 With Saints coach Sean Payton on the Competition Committee, don't be surprised if he lobbies aggressively for an overhaul of the replay system, up to and including de-centralizing the process and making all decisions from a booth at the site, similar to the college system. But more than that will be needed to avoid the non-calls as to both pass interference and unnecessary roughness, since neither are subject to replay review under current rules. To fix this one, the NFL will need to break from the lingering concerns about excessive stoppages and commit to finding a way to get calls right and to fix mistakes efficiently and reliably. It's a shame that it took a championship-deciding call to get the league's attention, but it's not a surprise. The league rarely takes proactive steps to prevent bad outcomes, waiting instead for the bad outcome to happen and then making a commitment to keep that specific bad outcome from happening again. This time around, the NFL needs to look broadly at what caused today's bad outcome, and to ensure that clearly bad calls and non-calls always will be fixed.